Underestimating Nerissa Jheanelle is a big mistake. 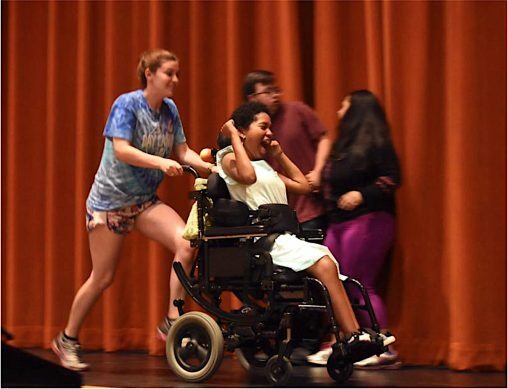 Those who do give Jheanelle, a senior Wright State University theatre studies major who has cerebral palsy, the fuel for a creative fire that has resulted in a dazzling array of work. In the past two years, Jheanelle has written a play and had it produced as a staged reading; conceived a dance piece choreographed by a close friend and turned into a video; created a movie script; and written the book and lyrics for a new musical that was performed and will be turned into a movie. W. Stuart McDowell, professor and artistic director of the Department of Theatre, Dance and Motion Pictures, said Jheanelle has created a body of work unlike any other he has seen in his two dozen years as teacher and administrator. When Tom Hanks visited Wright State in 2016, a question from Jheanelle about roles for “an aspiring actress with a disability” prompted him to give his most animated and poignant response. Jheanelle was diagnosed with cerebral palsy when she was 14 months old. As she was growing up, her parents nurtured her love of theatre. “My Mom and Dad used to make puppets and cut out all the characters of fairytales and act them out for me,” she said. Her visions became an autobiographical drama called “I Am A Warrior,” which was staged as a reading in the fall of 2017. Nerissa Jheanelle was one of the students who appeared on stage with Tom Hanks during the actor’s Q&A in the Festival Playhouse. The following spring, Jheanelle conceived a dance piece titled “Becoming a Skyscraper Again.” This vision was brought to life by senior dance major Halle Augenstein. The dance was turned into a video by motion pictures major Jeff Gardina. Then Jheanelle worked with her friend and assistant director Monica Impson rehearsing Jheanelle’s original musical “The Purpose of a Warrior Princess.” A staged reading will be presented in the Directing Lab in the Creative Arts Center on Saturday, April 20, at 2 p.m. It is free and open to the public. 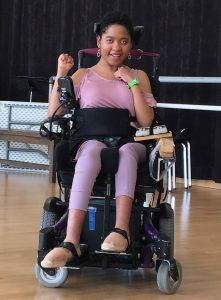 In her play “I Am A Warrior,” Jheanelle created the character of Nunu, a 22-year-old woman with cerebral palsy who is unflagging in her quest to discover who she is and where she came from.